WhatIfSports.com's NHL simulation engine played the Lightning vs. Penguins and Sharks vs. Blues 1,001 times each. Four teams remain in the hunt for the Stanley Cup. The Tampa Bay Lightning and Pittsburgh Penguins will meet in the Eastern Conference Finals. The Lightning are well-rested, having knocked off both the Detroit Red Wings and New York Islanders four games to one. The Penguins have played just one more game than Tampa Bay, beating the New York Rangers 4-1 and the Washington Capitals 4-2. The Western Conference Finals features San Jose and St. Louis. 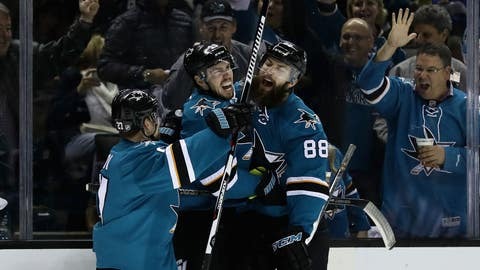 The Sharks have never reached the Stanley Cup Finals in the franchise’s 24 seasons, despite 18 playoff appearances and three prior trips to the Western Conference Finals. San Jose survived a seven-game series against Nashville in the second round, beating the Predators 5-0 in the deciding game. St. Louis is also familiar with Game 7s, as both their series went the distance. Thus far, the Blues are 2-3 in games that could decide the series. After ousting the Capitals, our heavy pre-playoffs favorite to win the Stanley Cup, you might think the Penguins would get some respect from the simulation engine. Not the case though, with Tampa Bay winning 53.2 percent of simulations by an average score of 2.12-1.95. In the West, San Jose is predicted to advance. In 1,001 simulations, the Sharks outscored the Blues 2.51-2.13, winning 58.8 percent of contests. In three regular-season meetings, San Jose won twice and outscored St. Louis 9-5.